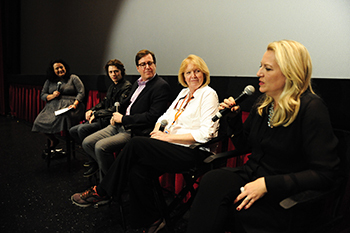 Cheryl Strayed, right, answers a question during a Q&A after a screening of “Wild” in Los Angeles on Nov. 20. From left are moderator Jenelle Riley, Nick Eversman, David Rubin and Nancy Haecker. David Rubin, a casting director who has assembled the casts for such films as “The English Patient,” “The War of the Roses” and “My Best Friend’s Wedding.” He is the casting consultant for HBO and chairman of the casting directors branch at the Academy of Motion Picture Arts & Sciences. Those attending also had a chance to meet and mingle at a pre-screening reception, and viewed a short video about Syracuse University’s Creative Writing Program by John Craddock, director of Mediaworks in the College of Visual and Performing Arts. “Wild” opens on Dec. 5.